Licensed practical nurses (LPNs) perform a number of basic nursing tasks. They work under doctors and registered nurses (RNs) in medical offices, hospitals, and health care facilities. They also might provide in-home care. This is a growing occupation with a high rate of job openings, because of the aging of the baby boomer generation. Becoming a licensed practical nurse does not require the same level of education or training as becoming a registered nurse, but they serve a key role in health care by assisting RNs and doctors in the care and treatment of their patients. LPNs carry out nursing tasks that are more complex than those that nurse's aides complete but less complex than the duties of a registered nurse. LPNs monitor the health of patients and look for signs that their health is deteriorating or improving. They check vital signs and watch for changes in monitor readings. Licensed Practical Nurses perform basic nursing functions like changing bandages and wound dressings. They comfort patients and make sure basic needs such as food and fluid intake are in order. Licensed practical nurses may also administer medications in some settings depending on institutional and state standards. The levels of care, such as providing medication, that LPNs can provide varies by state, so those entering the field should review state regulations where they intend to work. LPNs generally earn less money than RNs, but their pay will be higher than that of nurse's aides. Specific requirements for LPNs vary from state to state, but they must be licensed in all states. Generally, LPNs must complete a certificate or diploma program which typically takes about one to two years to complete. Education: LPNs can complete certificate or diploma programs at colleges, technical schools, and some hospitals. Some high schools even offer programs. Certification: LPNs have to complete the National Council Licensure Examination (NCLEX-PN). 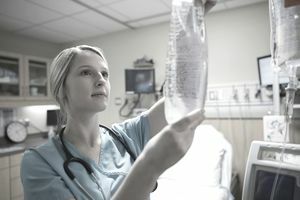 Some LPNs also may choose to become certified in certain specialties, such as IV therapy, nephrology, or hospice care. LPNs require a variety of hard and soft skills. While required LPN skills vary based on the specific job, there are a number of skills expected of most LPNs. Compassion: The job comes down to caring for patients, and often patients are very sick, severely injured, and possibly even dying. Making them as comfortable as possible has to be a priority. Patience: Caring for sick and injured people can be stressful, largely because patients sometimes are in pain or discomfort or otherwise unable to cooperate as much as they otherwise might. Stamina: Nurses are on their feet most of the day and sometimes need to help move patients or help them with physical tasks such as getting dressed, bathing, or using the bathroom. Communication: LPNs need to communicate with patients about how they are doing, and they also need to communicate to RNs and doctors about the overall care needed for each patient. Detail-oriented: LPNs keep track of multiple patients’ vital signs, dietary needs, sometimes medication schedules, and more. Even small errors with some of these details can have serious consequences, so nurses must be certain to be accurate. According to the U.S. Bureau of Labor Statistics, employment opportunities for licensed practical nurses are projected to expand by 12 percent from 2016 to 2026, a rate considerably better than the 7 percent growth projected for all occupations. Aging baby boomers will require greater health care services so LPNs with certifications or experience with elderly populations will be in the highest demand. LPNs work in a variety of health care environments as part of a team that includes doctors, registered nurses, and others. They serve in settings such as hospitals, nursing homes, assisted living facilities, health clinics, and private physician practices. Some also provide health care services at peoples’ homes. Nurses have to be able to stand on their feet for most of the day. They may need to help lift or move patients as well. Some LPNs work part-time, but most work full-time. Nights, weekends, and holidays are a regular part of many nurses' schedules since health care is needed around the clock. Shifts sometimes last longer than eight hours, but they may be part of a shorter work week. Certificate and diploma programs are offered at community colleges and even through hospitals. LPNs must be licensed in all states by passing the NCLEX-PN exam. LPNs willing to serve areas of greatest need—such as nursing care facilities—have the best chance of finding a job.